Insights on the most intuitive form of human machine interface. Necessity is the mother of invention. It is rumored that the first version of the Apple iPhone™ had a plastic cover made from the same material used in touch panels for decades. However, after a few weeks in the jeans pocket of Steve Jobs, the touch screen was so badly scratched (possibly from other pocket items such as keys) that he ordered a change from a plastic to a glass cover. Thus, Apple™ changed the touch device market by incorporating a seamless, protective cover glass on the top of the touch screen. This design change was both cosmetic (no ridges on the front) and functional, in that it protected the touch screen from wearing out. The phone’s “cover glass” or “cover lens” was ordinary window glass that chemically strengthened, cut with a hole for the home button, a slot for the earphone, and had a simple black decoration on the back. Today, the cover glass has become much more, and in monetary terms, has eclipsed the cost of the touch sensor. Compared to plastic, the glass had the advantage of better optical properties, scratch resistance, and electrical (touch) performance, but the disadvantage of breaking on impact. To prevent against breakage, glass is hardened by either heat tempering or chemical tempering [insert link to TI white paper on glass]. Since heat tempering can leave tiny ripples that can distort the display image, all touch screen cover glass is chemically strengthened. The cover glass is made from large sheets of glass, usually .55mm, .75mm or 1.1mm thick, cut to the approximate final size by an “XY” glass cutter. In high volume operations (quantities larger than 5,000 units per month), the small rectangular sheets are glued together into a brick using beeswax and then ground into needed shape by a grinding wheel. Once the glass brick is ground a diamond drill bit cuts holes in the stack. The beeswax is melted off and the glass is made ready for routing for such things as the earphone slot. At this point, the glass may be polished to remove manufacturing residue, but most likely placed into a high-temperature salt bath for 8 to 16 hours for chemical strengthening. For cover glass volumes of less than 5,000 units per month, a numerical control (NC) machine is used to grind and seam the edge. Then, holes and slots are cut into the glass, followed by chemical tempering. After the cover glass is strengthened, the non-touch side (back) of the glass is printed with one or more colors. It is then attached to the sensor and finally installed onto the device. The next big change occurred with the introduction of AAS glass by Corning™, branded as Gorilla Glass™ (soon followed by Dragon Trail™, Xensation™, and others). When chemically strengthened, AAS glass has about the same break resistance as standard cover glass, but when the AAS glass was scratched (think keys again), it did not lose its “strength” in the same way conventional glass did. Thus Samsung and Apple advertised the use of this glass in their phones and it became commonly used. Proceeding Gorilla Glass™, changes to cover glass next came in the form of coatings on the glass. The advent and popularity of the “selfie” created the need for better optical performance on a phone’s front-facing camera. Thin chromatic coatings were put behind the peephole, and anti-fingerprint coatings are now added to the surface of the cover glass to keep the image from the display clear and sharp. Historically touch panels had anti-glare coatings, and there is renewed interest in this feature as well. Anti-reflective coatings, combined with an anti-wear coating, helps sunlight readability. Primarily for design reasons, Touch International is now bending cover glass into 2d and 3d shapes; the first 2d production phone is the Galaxy Edge™. For “blackout” looks, the cover lenses are also tinted so that the display is only seen when it is on. Touch International believes that cover glass will either be eliminated or will be replaced by plastic. Though plastic failed in the past due to scratching, there are anti-scratch coatings for plastic that Touch International applies that has the same hardness of glass. These coatings are expensive, but as prices come down, so will the requirement for glass as the lens. And, due to advances we have made in touch sensors, we are now incorporating the touch panel directly into the plastic housing which we also manufacture. So the cover glass and touch sensor are incorporated into the “box” and both the cover glass and touch panel, as we know them, will be gone. Touch International has more information in the touch screen white papers on this subject. All trademarks and registered trademarks are the property of their respective owners. Touch International is not affiliated with Apple, Corning, Gorilla Glass, Galaxy Edge, Dragon Trail, Xensation, or the iPhone. I believe the phrase goes something like “the only thing you have to fear, is fear itself.” Display end-of-life (EOL) is a concern for every display project out there, whether people are conscious about it or not. The good thing is, you’re thinking about this now as opposed to 3 years into production, or even worse when you find out you can no longer order the displays. Now, some manufacturers are great about notifying you about the projected life of a product, and even send a nice EOL letter up to a year ahead of time. This usually only applies to those customers that buy directly from the manufacturer. If you’re going through distribution, the chances that EOL notification is going to filter its way to you decrease greatly. It may sound overly simple, but the key to ensuring long display life is really just finding the right display from the right manufacturer. I know, not much help right? Let me elaborate. I’ll be careful not to name any names, as I don’t want to ruffle feathers, but let’s just say some manufacturers have a better at display lifespan than others. For example, if you’re picking a display from a manufacturer that produces mostly consumer-grade products – you’re taking a risk. 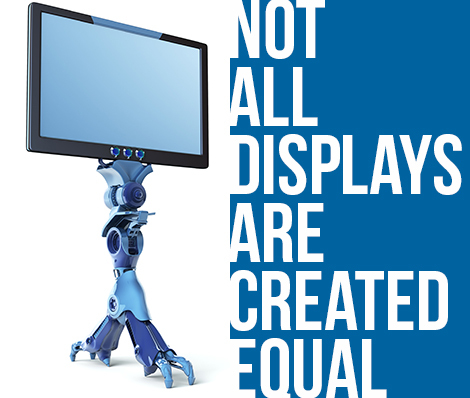 Consumer grade displays have their own issues in the industrial space, and we’ll get to that, but the manufacturers of these displays tend to play by a different set of rules. EOL can come within 6 months of a product released, for no other reason than a left field higher up decision. When you play in the consumer products game, you are at the mercy of consumer product manufacturers. Because of immense volumes, consumer device manufacturers have the buying power to heavily influence display manufacturers product lines. It’s a two-way street as well, the display manufacturer will look at trends and customer information, and might just decide that 7-inch display you just ordered in the exact resolution you wanted, isn’t the resolution their giant consumer products customer wants, so they cull the herd and replace it accordingly. If you have the volumes to influence this kind of behavior, more power to you. For most industrial and specialty applications, this is simply not the case. Now as far as the display itself, avoid consumer grade products at all cost. Consumer LCD’s are developed to be thinner, lighter, and cheaper. Thinner and lighter can sound great, but don’t take the bait so fast. Sometimes these displays can lead to engineering nightmares, quickly diminishing any profits you could have gained from choosing the lower cost display. Some displays have thin plastic bezels, others are taped together. This is not always indicated on drawings and is often missed by misguided customers seeking clarity in all things LCD. Bottom line, unless you’re knee deep in the consumer products market, avoid consumer grade displays. Industrial applications require industrial components. In some cases, we are able to find a better performing industrial LCD for a lower cost than the consumer grade LCD the customer originally planned on. Here at Touch International, we can source and enhance almost any size or brand panel. Our experience has given us preferred brands, competitive pricing, and we certainly have our sweet spots like anyone else. 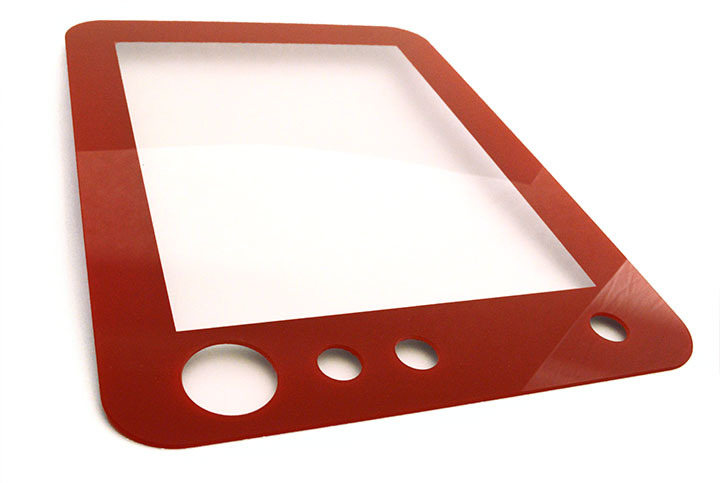 We only source A-Grade panels manufacturer direct or from qualified distributors. If you want to design your product right the first time, you must define the right display. What are the differences (if any) in anti-reflective, anti-fingerprint, anti-smudge, and anti-glare?? Every piece of information I find ends up as a sales pitch. Can you clarify things for me? Touch guy thought that the new fad of taking and sharing selfies meant everyone wanted to see themselves (a lot), so he wonders why there are so many requests for anti-reflective/anti-fingerprint films (AR/AF) on his products. He is so out-of-touch (haha). Ok, enough cracking myself up. What customers want when they ask for AR coatings is to reduce the ability to see oneself when looking at the display, especially when you are outside. Ultimately, AR coatings make the display easier to see. In legacy touch products, glare reduction was done using anti-glare (AG) coatings. AG treatments are made by either coating the touch surface with silica “bumps” or lightly etching the glass. The result is that some of the light hitting the touch surface is diffused or scattered, and not reflected back at the user. This was good enough for 25 years of touch technology. Then along comes Apple and their beautiful high-resolution display to upset the cart. To preserve that super display image, polished glass was used on the iPhone instead of the traditional AG treatment. It is kind of OK for mobile devices because you can tilt the surface to reduce reflections, but less easy to “fix” on bigger devices such as pads. So the market is asking for something that reduces reflections but preserves that pretty little picture on the display. This has traditionally been done using anti-reflection treatments. Reflection reduction can be achieved in a number of ways, including moth-eye treatments, circular polarizers, eliminating the reflective surface, or that which I will talk about, multi-layer thin film interference coatings. Touch Guy finds that customers want less than 1% of the light (your pretty face) to be reflected, and that is pretty commonly (though still not cheaply) achieved. If you have enough money (and don’t mind parting with a chunk of it), you can get an AR stack to have less than 0.1% reflection. It used to be that only a few companies could make production quantities of AR coated material but the demand for this stuff has dramatically reduced the cost and increased the number of suppliers, both on plastic and glass. There are two problems with AR coatings on touch screens. The fingerprint problem has been fixed with anti-fingerprint (AF) coatings. Recalling the description above, you know that the thin film coating must be the precise thickness of a light wave (say ¼ of the width) to work. Along comes your dirty, oily fingertip, laden with hand cream, to touch the screen. Boom, the oil you left on the AR coating has changed the thickness of the coating which reduces the ability to trap the light and most often shows up as a fingerprint. AF coatings work by resisting the ability of the oil on your finger to “stick” to the AR coating; these are called hydrophobic (fear of water) coatings. 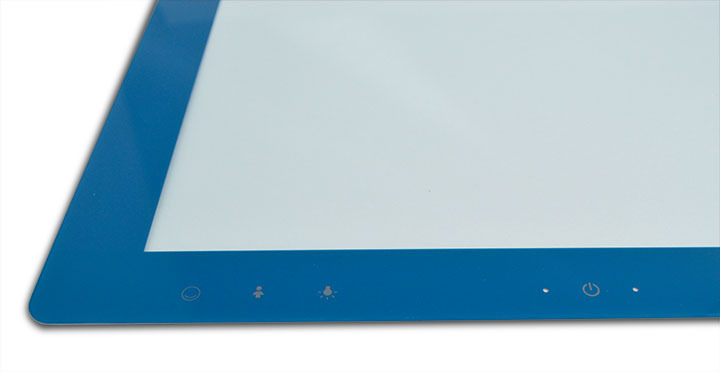 Of course, for the AR coating to work, the AF coating must be built into the precise thickness of the thin-film stack. Touch Guy is not impressed with the aftermarket spray-on AF coatings over AR stacks. Not impressed at all. AR problem number two is that it wears off…think about it, angstroms thick material in an abrasive and chemically active environment, and you have limited time before its anti-reflection properties go away, especially on frequently touched areas. There seem to be two solutions…the first is that the AF coating on the AR stack is made of (secret) tough material that will wear-off your fingertip (just kidding) before it gives up. The other is to use thicker, but less effective (2% reflection) organic AR coatings, that seem to have better resistance to finger wear. Another way around the AR wear problem is to eliminate the reflective surfaces in the first place. Touch International is a big supplier of optically bonded (touch panel to display) products which increased the ruggedness of the display while eliminating the internal reflections. An AG coating and an optically bonded p-cap touch panel eliminates the wear, and anti-fingerprint issues, with only a minor loss in display sharpness. And the new p-cap+ product has a secret method of AR reduction. http://touchinternational.com/wp-content/uploads/2018/05/TI-Logo-Long-Caps-Web-300x54.png 0 0 admin http://touchinternational.com/wp-content/uploads/2018/05/TI-Logo-Long-Caps-Web-300x54.png admin2014-03-14 13:04:332018-10-04 09:12:50What are the differences (if any) in anti-reflective, anti-fingerprint, anti-smudge, and anti-glare?? Every piece of information I find ends up as a sales pitch. Can you clarify things for me?